After a car accident, you’re overwhelmed and disoriented. Your adrenaline is pumping through your body, and you may be more concerned with the safety of your passengers or damage to your vehicle than that of yourself. And when there are no obvious broken bones or major injuries, it can be easy to assume that you are okay. But what if you develop pain over the next day or two? It’s not unusual for post car accident symptoms to be delayed, and in many cases you may not realize you sustained injuries until days or even weeks later. Below, we explain what types of pain after a car accident may not show up until later, and what you can do to protect your rights. To learn more, speak to a car accident attorney at the Law Office of Manning & Zimmerman PLLC today. The combination of being excited and distracted after an accident can mask your pain and numb you to any signs of injury. While some trauma is pretty obvious, (i.e. displaced fractures or lacerations), other injuries are more subtle at the outset. For example, you could have suffered a concussion or injury to your spine without being aware of it at the time. What seemed like a slight headache could be a sign of a serious head injury. Or an ache in your neck be the result of a herniated disc. That’s why seeking medical attention immediately after a car crash is vital. Even if you initially think you are symptom-free, you need to know the signs and types of pain after a car accident so you can get the treatment you need if you have suffered injuries. Headaches or dizziness may mean you have a concussion, whiplash, a neck injury, or a blood clot. Most importantly, if you bounced around violently or banged your head during your car accident, a headache may be a sign of a life-threatening traumatic brain injury (TBI). Any impact to the head can damage the brain’s soft tissue, causing bruising, bleeding, and swelling. Remember, you can walk away from a car accident and still suffer a traumatic brain injury, which may impact your ability to speak, increase your sensitivity to light and sound, and cause memory and concentration problems. If you experience pain in your back a few days or weeks after an accident, consult a doctor. Back pain may be a symptom of a sprain, a spinal injury, a herniated disk, or a soft-tissue injury. Damage to muscles, ligaments, or tendons are soft-tissue injuries. They often are difficult to diagnose because they cannot be identified, like broken bones and fractures, on x-rays. Whiplash, which is an injury to the neck muscles and/or ligaments, is one of the most common soft-tissue injuries that is often overlooked. People often assume the pain is no different than a sore muscle and will quickly go away with time. However, if these injuries go untreated you may experience long-term crippling pain and mobility problems. 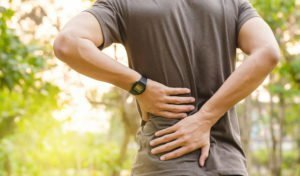 Feeling a stinging sensation or slight prickling anywhere in your body following an accident can mean you have a pinched nerve or a herniated disk. This type of injury could also cause pain radiating down your legs or arms. A ruptured disc in your spine can leave you paralyzed. If you begin experiencing numbness, tingling, or radiating pain in any body part, get evaluated by a physician. Stomach pain may indicate internal bleeding or injuries. Pain can start hours or days after an accident and require emergency treatment. If in addition to the pain, if you feel dizzy, go to the hospital immediately. We aren’t doctors and you know your body better than anyone else. So, if you feel different or off after a car crash, or have any symptoms that are concerning, whether listed in this article or not, we recommend that you promptly speak with a medical professional. Always consult with a doctor as soon as possible after a car accident. Your doctor’s notes will be important evidence in your injury claim. This is because they will document your earliest post car accident symptoms and link them to the car accident. These notes could also help future medical providers better understand your injuries so they can make sure you get the proper care. Taking this step may minimize the challenges that can arise when you experience delayed car accident injuries. Insurance companies in these cases often assume victims are exaggerating or lying about their post car accident symptoms. Insurers also will try to claim that delayed symptoms are the result of other activities or accidents that occurred after the crash. If you experienced delayed pain after a car accident and are wondering how you can hold the other party liable for your injuries and obtain the compensation you need, speak to a Manchester NH car accident lawyer at the Law Office of Manning & Zimmerman PLLC at (603) 671-3156.